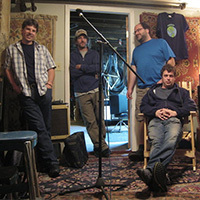 American Beauties is an original independent folk-rock and folk-pop band from Somerville, Massachusetts. The music is reminiscent of the LA, San Francisco, and East Coast folk-rock bands of the late 1960s and early 1970s and mixes both contemporary and roots influences. Their debut record, Too Worn To Mend, was independently released in October 2012. The album was recorded at Ice Station Zebra in Medford, Massachusetts by Grammy award winning engineer Ducky Carlisle.